In this public presentation Professor Christopher Anderson presents his latest ground-breaking book, The Numbers Game, co-authored with Professor David Sally. In the book, the authors demonstrate that every shred of knowledge we can gather can help us to love football, and understand it, even more. For example, why stopping a goal is more valuable than scoring one, why corners should be taken short, and why it is better to improve your worst player than to buy a superstar. Football has always been a numbers game: 4-4-2, the big number 9 and 3 points for a win. Using the wealth of data that is now available about what happens on the field, and drawing from current theories in the social sciences, Anderson and Sally undermine many of the conventions of on-field strategy and club management. Their book brings together colourful stories and telling statistics in an engaging and insightful dissection of contemporary football. 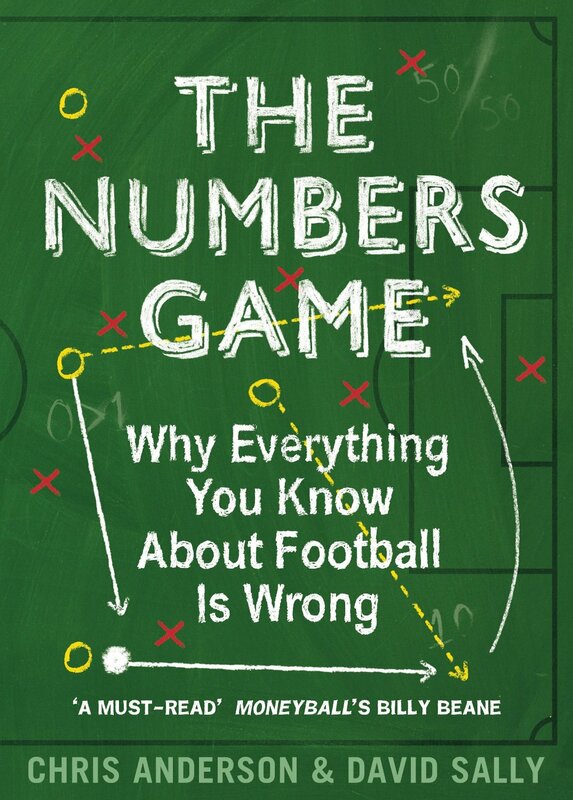 The Numbers Game provides the answers to many questions about the beautiful game, such as: What if up until now we’ve been focusing on the wrong numbers? What if the numbers that really matter, the ones that hold the key to winning matches, are actually 2.66, 53.4, 50/50, and 0 > 1? What if managers only make a 15% difference? What if Chelsea should have bought Darren Bent? 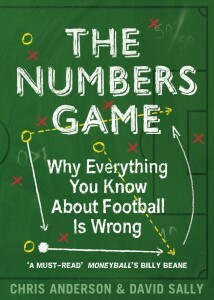 Following on from two other milestones in the development of the use of data analytics in sport – the establishment of teh sports data analytics company Opta in 1996, and Michael Lewis’s Moneyball from 2003 – The Numbers Game sets out to comprehensively review the understanding of the modern world of football through the use of data analytics – the key for fans to debate and unlock their teams’ performance. Age 17, Chris Anderson found himself playing in goal for a fourth division club in Germany. He is now a pioneer of football analytics, and a professor at London School of Economics (LSE) and Cornell University in the US. He consults with leading clubs, writes the popular Soccer by the Numbers blog, and contributes to the New York Times. Anderson has held appointments at several universities and business schools, including Oxford University’s Nuffield College and Northwestern University’s Kellogg Graduate School of Management. He is the recipient of a number of awards, including the American Political Science Association’s Heinz Eulau Award for the best article published in the American Political Science Review, the Best Article Award from the Journal of Politics, and the Emerging Scholar Award from the APSA Section on Elections, Public Opinion, and Voting Behavior. He has served as President of the American Political Science Association’s Section on European Politics and Society, and on the editorial boards of the American Journal of Political Science, Electoral Studies, European Union Politics, and the Journal of Politics. A native of Germany, he studied at the University of Cologne, Virginia Tech, and Washington University in St.Louis, where he received his PhD. Anderson, C. and Sally, D. (2013). The Numbers Game. London: Penguin.